The 2017 Panerai Design Miami/ Visionary award celebrates community members who have made significant contributions to the field of design. 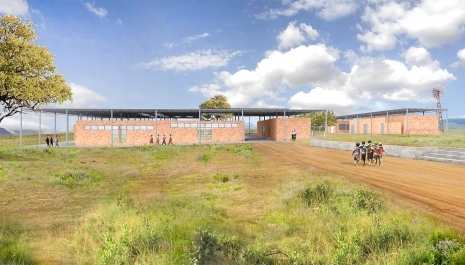 This year, the award is presented to the Mwabwindo School, a collaborative educational project in rural Zambia developed and operated by 14+ Foundation, designed by Selldorf Architects, with artwork by Rashid Johnson, and newly commissioned furniture by Christ & Gantenbein, all of whom have provided their services pro bono. Opening in 2018, the school will provide quality arts-based education to the community. As the Visionary commission, produced for the Panerai Design Miami/ Visionary Award, prototypes of Christ & Gantenbein’s Mwabwindo Series will be unveiled at Design Miami/ in December before being directly produced on-site by the Mwabwindo community in Zambia. More than furniture, the Mwabwindo Series is an idea. Based on a simple vernacular object, this tectonic design speaks about interpretation and authorship, relying on Zambian craft tradition, sustainably sourced woods and the human touch for its construction.